Last week, I gave you the story and recipe for yummy summer-time Strawberry Margaritas. Well, that wasn't all - I'm not a lush, ya know! 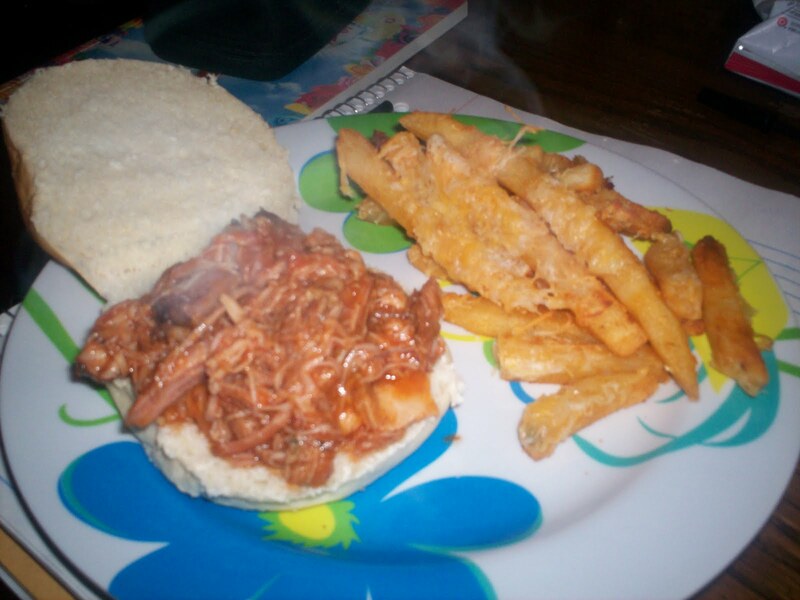 Our friend, Amber made some Deee-licious BBQ pulled pork sandwiches. Eric and I couldn't decide what we were more excited about, the drinks or the pulled pork! Amber works with Eric at Whole Foods Market in the Prepared Foods Department. They have been working together for about 2 years now. She's a tough, but shy, young lady who didn't have much in the way of culinary knowledge when she first started, but she loved cooking and figured it would be a way to improve. Eric trained her in the first week and he loved working with her. 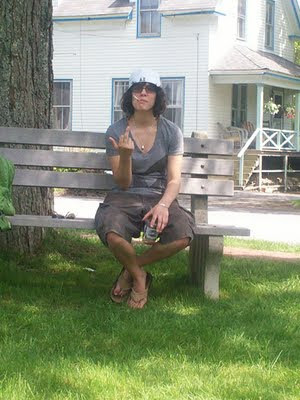 She was eager to learn, had a positive attitude, and was good at taking direction. Even though we have quite a bit of culinary knowledge and experience; that's all that makes a co-worker, a great co-worker. Though Amber has a tough exterior, she shows she cares for her friends and loved ones by cooking for them - it all comes from the heart. And boy, did she show us some love! It was her first time making a barbeque sauce and she did such a wonderful job, I had to write about it! Her pulled pork was like BUTTAH!! Unfortunately, I wasn't there for the whole cooking process, so there won't be as many pictures. But there's nothing too technical happening here. 1) Combine your seasonings for the rub in a small bowl and mix. Rub all over your cut of meat. 2) Your going to heat a medium sized pot with some oil and sear all sides of the pork. Cook on each side till nice and brown, about 5 minutes. 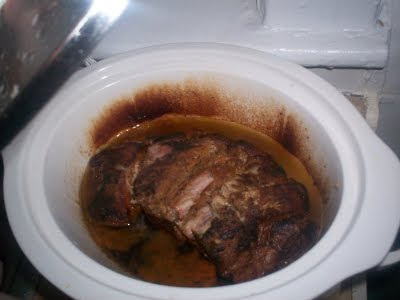 After the pork has been seared, you can put it in a crock pot and let it cook for about 6 hours. While the pork is cooking, you can prepare the sauce. Save that pot and don't clean it out, you are going to use it to make the bbq sauce. 3) Let's start with roasting the poblano pepper! There are two ways you can do this. You can put it in a oven at 350 degrees till it is soft and cooked. Or if you have a gas stove, you can put the pepper over the flame and char the skin. Keep rotating the pepper till the whole surface is browned and soft. Once the pepper has cooled, you can peel off the skin. Cut the pepper in half and remove the seeds.The flesh of the pepper is where the flavor is and the seeds are where the heat is. Chop the pepper and hold it aside while you prepare the sauce. 4) Saute your onion and apple in your pre-seasoned medium sized pot. You can brown them a little to add some roasty flavor. 6) Cook all together still the apples have softened and the flavors have melded together. 7) Pull out a blender or food processor and blend the bbq sauce. Once smooth, you can strain so that its nice and smooth. You can cool the sauce and hold it till you the pork is ready. The sauce may be a little thick but when it combines with your pork and all the juices that have been produced from cooking it will not be so thick. 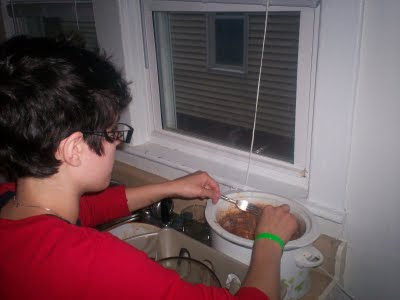 8) When your pork is ready take two forks and pull the meat apart. It will fall apart ever so easily! Add your sauce into the crock pot with the meat and your ready to go! For a first time BBQ, we were impressed! And also Amber wouldn't let me have the recipe unless we really loved it. The moral to this story.....or the reason why I chose to highlight Amber's first time BBQ, is because it was an experiment. All too often, people are so afraid to cook because they might screw it up. Let me tell you, there are very few times when a recipe can turn to complete failure. The beauty of cooking is that it can almost always be fixed (kinda like life). Take your time and taste what your making. Do not be afraid, and just have fun with it - it's only food. Remember, if the kitchen gets too hot, get back in there and keep cooking!